Song request wind band style! 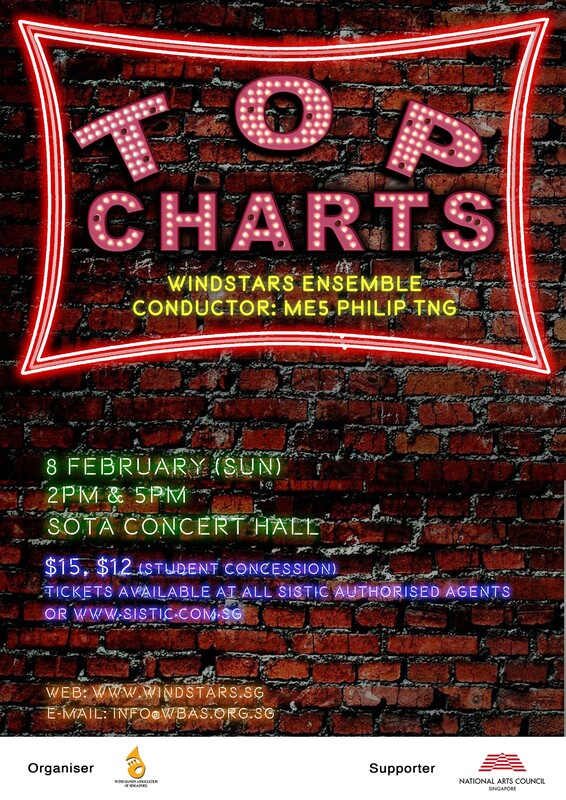 Performed by Windstars Ensemble, Top Charts, is a showcase of popular wind band repertoire chosen and voted in by our audiences. Enjoy classics works such as Persis Overture, El Camino Real, The Times, and pop numbers such as Japanese Graffitti, Studio Ghibli’s Medley from Princess Mononoke and many more! Part of the Windstars Ensemble’s educational initiatives, student band members will join the band to play alongside at this concert under the baton of conductor ME5 Philip Tng. We are pleased to announce that local schools will be able to use Toteboard to subsidise their students’ tickets to Top Charts for up to 50%! Meaning your student pays only $6.50 for the concert! Grab your tickets today from SISTIC or our bulk booking form. Having started his musical education on the piano at the age of ten, ME5 PHILIP TNG has since spiraled through tremendous musical boundaries to reach his current position as the Senior Director of Music of the Singapore Armed Forces (SAF) Band. As a saxophonist with the SAF Music and Drama Company, he was awarded a scholarship to the Royal Military School of Music, Kneller Hall in London. Upon graduation from the Bandmaster course with several accolades including the Graham Wallace Award for best overseas student bandmaster, the Sommerville Prize, and the first prize in the Fanfare Award of the Fred Mortimer Memorials Competition in 1993, ME5 Tng went on to become the Director of Music of the SAF Central Band. He held this position for five years before assuming the post of Senior Director of Music of the SAF Band in August 2000. ME5 Tng is active in many musical activities in Singapore, including conducting the National Day Parade and adjudication of local band competitions. In 2005, both the SAF Central Band and his community band, West Winds, were selected to perform at the World Association of Symphonic Bands and Ensembles (WASBE) Conference held in Singapore. ME5 Tng has also been invited as adjudicator in Australia, Malaysia and as guest conductor at the Western International Band Clinic (WIBC), Seattle in 2006. ME5 Tng received another scholarship from the Singapore Armed Forces in 2008 to pursue his Masters in Wind Band Conducting at the University of Illinois at Urbana-Champaign. During his studies, he had the privilege to study conducting with numerous conductors, namely, James Keene, Abel Ramirez, Roby George, Robert W. Rumbelow, Tim Foley, Stephen Peterson and Russel Mikkelson. Graduating with excellent academic achievements, ME5 Tng was initiated into the Phi Kappa Phi Chapter at the University of Illinois at Urbana-Champaign. * The Military Domain Expertise Scheme (MDES) is a new military scheme for specialised vocations in the Singapore Armed Forces. ME5 is equivalent to the rank of a Major.